In today’s video, I just had to pull out my watercolours. If you’ve been following along with me recently you’ll know how much I have enjoyed watercolouring this last year and when I looked back I couldn’t believe it has been over a month since I painted! 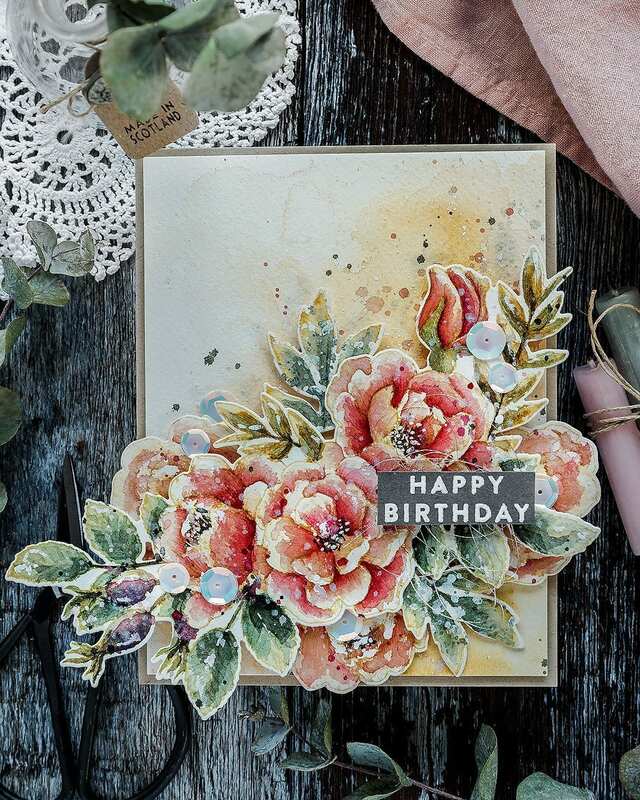 I rummaged through my stamp sets and pulled out a favourite, the Beautiful Flowers set from Simon Says Stamp. I’ve used this set before (here and here). However, the matching dies got released at a later date, and I’ve not had a chance to put the stamps and dies together yet. That was my vague excuse anyway for wanting to get my paints out and colour this gorgeous bouquet again. I’ve linked all supplies at the end of this post. Compensated affiliate links used where possible at no cost to you. I like to use Arches cold pressed watercolour card, which has a lovely texture to it that makes painting on it a dream, but the texture does make it tricky to get a clear stamped impression if you are using black ink and then watercolouring. However, I like to stamp with Antique Linen Distress ink and then paint in a no-line style. This Distress Ink is light in colour and water reactive so as you paint the lines blend in and you get a lovely no-line watercoloured look. I laid out the large bouquet image, and the three individual flowers on Arches Cold Pressed card and stamped them a few times in Antique Linen Distress Ink until I had a clear impression to colour. I then taped the piece of card to a board with blue painter’s tape and started to paint. I used a variety of Daniel Smith watercolours which I will list below along with the other supplies I used to make this card. I took the painting slow to enjoy myself. With various interruptions for parcel deliveries and children etc., this card took me over 2 hours to complete. However, I love to paint and find it very therapeutic and so I didn’t mind the time passing. I guess with a time-intensive card such as this I will make sure to send it to someone who will appreciate it. I’m a tentative painter, and so I start with light layers of colour and build up slowly bit by bit adding more layers. This process is sometimes called glazing with the additional layers allowing the initial layers to show too. The joy with transparent watercolours is that each layer works with the others to form the overall colour. Also, it is much easier to add more layers and deeper colours than it is to try and lift them away if you’ve gone in with a heavy hand. I added more details to the large bouquet whereas when I painted the individual flowers, I kept things very loose and to a certain extent indistinct. The reason for that is that I want to tuck these flowers behind the main bouquet and I felt that a looser style would suit these flowers and give them the appearance of being slightly out of focus as you would get when the eye is concentrating on the main focal point. With this in mind, I also kept the painting of these flowers lighter – things appear paler the further they are away from you. I’m hoping that this looser, paler painting of these flowers means that they will support the focal point when tucked behind the main bouquet but won’t compete with it. Having finished with the bulk of the watercolouring, I added touches of white gouache to bring in some highlights. Gouache is an opaque watercolour and so these white dots I’m adding here, and there will still show up even if they are painted over a dark colour. I then took my favourite solution of perfect pearls; this is a scoop of perfect pearls in a mini mister, topped up with water and give a good shake before using the tube from the mister to splatter the sparkly mixture over the painting. I also splattered some leftover paint too and then dried everything with a heat tool. I then took the matching Beautiful Flowers dies and held them in place with washi tape before running them through my die cutting machine. With my spray of die cut flowers coming together nicely I took another piece of Arches Cold Pressed watercolour card to create a loose watercoloured background on which to mount them. I taped the piece to a board and thoroughly wet it before bringing in a warm yellow and then a pinky coral. The colours easily move and mix on the wet surface to create a soft background. I used a heat tool to speed up the drying process and a paper towel to sop up extra colour and keep the background light and airy. I then went in with a second layer before splattering the background liberally with leftover paint, white gouache and more of the perfect pearls mix. I kept bringing in the flowers to make sure I had enough colour and splatter where I wanted it and then dried the piece a final time. I trimmed the background to be 4 1/4 by 5 1/2 and then started arranging the flowers on the panel. I realised I wanted a few more leaf sprigs and so I turned to the Beautiful Flowers 2 set which has a few options, and also the matching dies too. I stamped and watercoloured a leaf, splatter liberally as before and then die cut with the matching die. I added the watercoloured background panel to a Desert Storm card base cut from the 100lb weight and sized to be 4 1/2 by 5 3/4 – just slightly larger than an A2 card base. 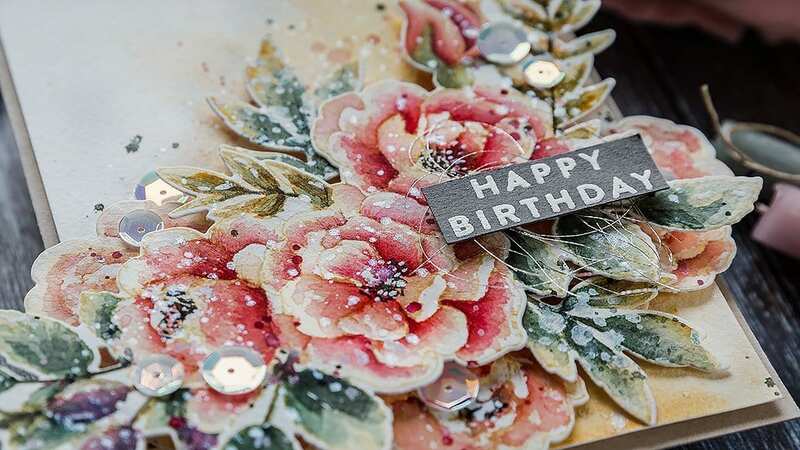 I arranged the die cut images on the card front and kept the individual pieces in place with foam tape and then to add more dimension I added a double layer of foam tape to raise the main focal point slightly. 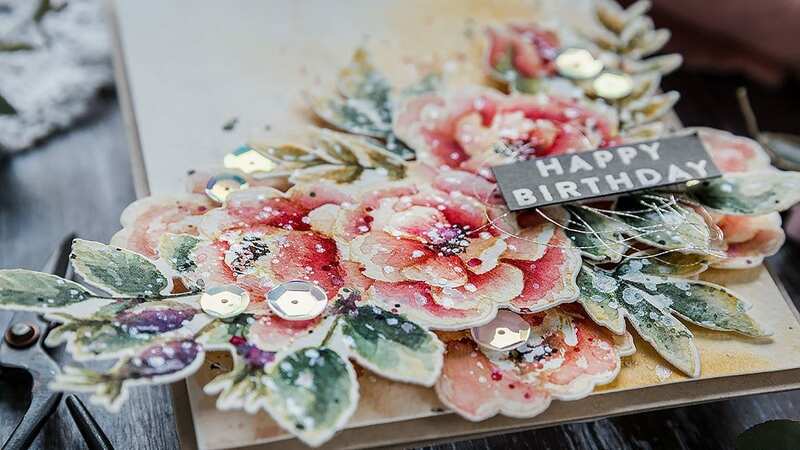 I also decided on adding another leaf sprig to the arrangement so went back and stamped, watercoloured and die cut that before adding it to the card. I then scattered around a few sequins and kept them in place with Gina K Connect glue. I must admit that the sentiment for this card was a bit of an afterthought. I was so invested in the watercolouring that really the sentiment was the last thing on my mind. 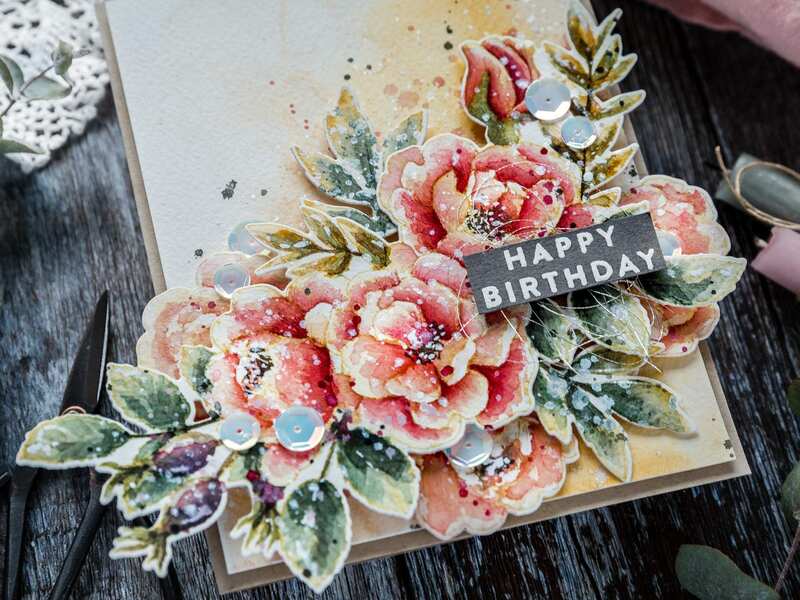 However, when I got to this point, I realised I needed to add something and when I looked at the options in the Beautiful Flowers set I picked the birthday greeting as I send more birthday cards than anything else. I treated a piece of Slate card with an antistatic powder bag and then stamped the sentiment in clear embossing ink before sprinkling with white embossing powder and heat setting. I trimmed the piece to a banner and then added to the card with foam adhesive. I also wound a little silver thread around my fingers and added that under the sentiment banner too for added interest. Oh wow. What a beauty! 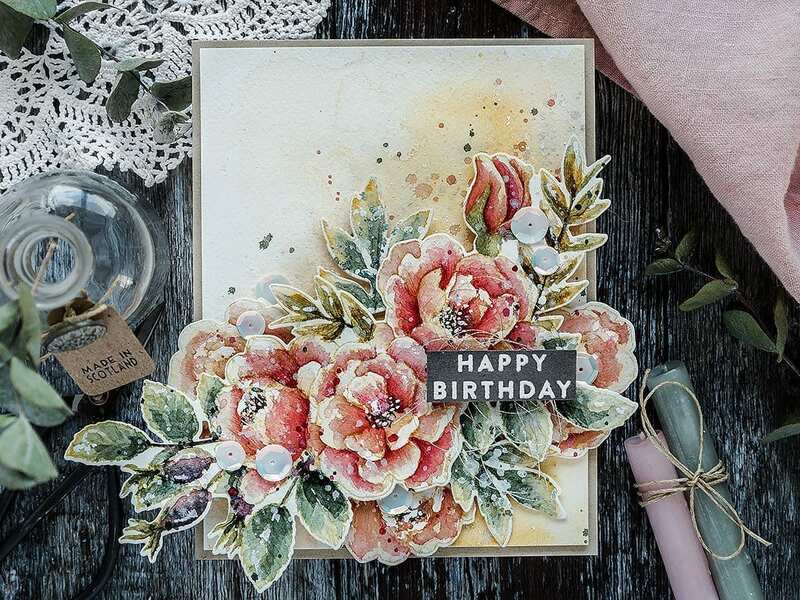 This card is absolutely stunning, it would be perfect for any occasion, your painting is so beautiful, thank you for sharing your creative talent. Hi Debby! Your no line water coloring is stunning! I enjoy your videos so much. Thank you for taking the time to produce them and share your talents. Have a Lovely Day!